This could be the green energy source of the future. Physicists at the University of Houston have discovered a low-cost, efficient, and easily available catalyst that can split water into hydrogen and oxygen. The catalyst is far more efficient than other options that have previously been employed, and because it is grown from ferrous metaphosphate on a conductive nickel foam platform, it is both more durable and cheaper to produce. Breaking water down into its components — oxygen and hydrogen — is theoretically simple, but practically complex. The process demands two separate reactions, each with its own electrode; one reaction evolves hydrogen, and one evolves oxygen. While hydrogen is the component that is sought after in this process, it can’t be attained without producing oxygen — and that’s the issue. Efficient oxygen catalysts, unlike the readily available hydrogen catalysts, are hard to find, and that’s where this discovery comes into play. 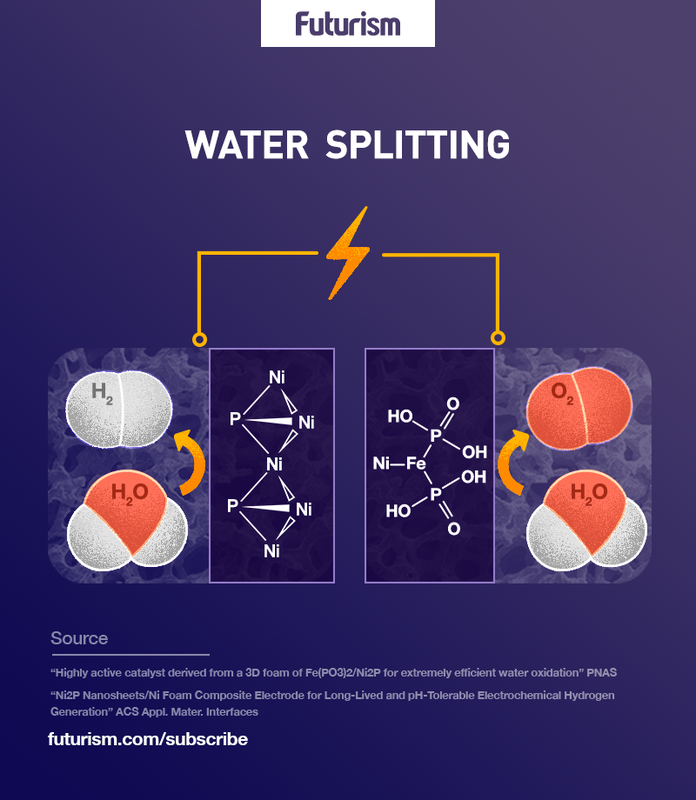 Either electric current or photocatalysis can trigger water splitting. However, since water absorbs only a narrow section of the light spectrum, the direct solar-powered splitting of water is too inefficient. Instead, using solar to power the electrical current used to split water molecules and produce hydrogen for energy is a better plan. Hydrogen, when produced, is one of the best renewable energy sources. It is stored easily, unlike solar or wind power, and, using solar to produce hydrogen eliminates the carbon footprint left by producing hydrogen through traditional methods like coal gasification or steam methane reforming. “Hydrogen is the cleanest primary energy source we have on earth,” Texas Center for Superconductivity chief scientist Paul C. W. Chu told UH News. Now that these researchers have discovered a way to produce hydrogen cheaply with no carbon footprint, this may very well be the green energy source of tomorrow.